Ain-Bet names Watch. According to the Kabbalah the Ain-Bet names, are 72 special combinations of letters, comprised from three verses from the book of Deuteronomy 14, 19-21. Each verse is composed of 72 letters that together form a powerful spiritual frequency, which serves as a cure against negative energies and ego. The use of these 72 combinations of letters helped Moses overcome nature and allowed him to split the sea, so that the people of Israel could pass through. The kabbalah tells us that we can control the physical nature. The only obstacle is our ego, and if we overcome it, we could channel and manipulate nature to our advantage. Metal are: Silver. 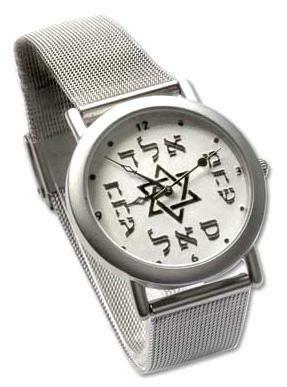 This Watch is made with silver 925.